It was a game that shook the chess world and broke many a heart (Vishy fans!). 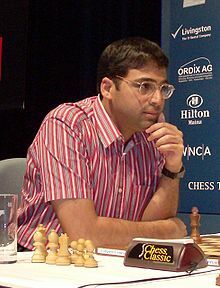 After 8 games Vishy was trailing by two points in the World Championship Match at Chennai. In his own heart he had probably given up hope. But he had his pride and wanted to show he could still play great chess. Then came this game, with Vishy opening with 1.d4. In the previous games of the Match he had not been able to entice Magnus into any of his sharper schemes with 1.e4. So there had to be a change of front with 1.d4, proof of his aggressive intentions. He met Carlsen’s solid Nimzo with 4.f3, a forceful line once espoused by Shirov. Apparently Carlsen was not prepared for the opening and took a grave strategic risk with 8…c4?! and played 18. e5, preparing a pawn storm on the kingside. With the benefit of hindsight one could say, 18. Rb2! was strong, preventing Black’s counterplay on the queenside before advancing on his king. Nevertheless, the position remained dangerous for Black after 18.e5. Now Magnus boldly went for counterplay with 18…Nc7 19. f4 b4 and the battle was joined. Here Anand played 20. axb4, a move that was widely criticised. But it has its logic. Black rook was guarding the third rank and ready to come to the aid of the king. Anand must have thought, with this move he could get rid of the rook and also force the knight to go far away from his king. Yet other moves may be better. Hikaru Nakamura proposed 20. a4!? After 20…b3 21. Raf2. This is a thematic follow up of 13. Ra2 played before and White develops his attack with renewed vigour. His only source of concern is the now isolated a-pawn. But as the accompanying analysis shows, it cannot be easily won. 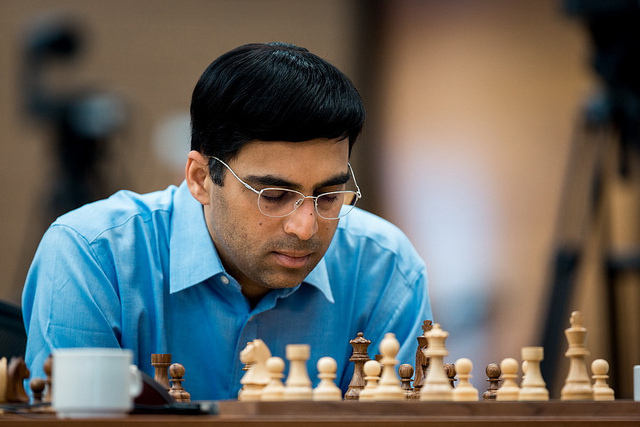 Nevertheless, everything appeared to go Vishy’s way as White pawns made an impressive march on the kingside. Meanwhile Black knight was forced to shuffle between c7 and e8. Carlsen’s only hope lay in the advanced b-pawn. Here Vishy played 24.f6, an obvious move that was subsequently termed “premature” by commentators. They recommended instead the flexible, waiting move 24.Qf4. Indeed, it is not easy for Black to defend as he does not know where the axe would fall. A case of threat being stronger than execution. So far the game had run an exhilarating course that had spectators worldwide hooked. Even as spectators tried to calculate a mating finish after 28 Bf1 Qd1 29.Rh4, Vishy blundered with 28.Nf1??! !, a move that had his fans bewildered. After 28…Qe1! the game to an abrupt end. “As soon as I made the knight move I saw what I had done” said a resigned Vishy who gave up on the spot. But why did he reject 28.Bf1 and choose Nf1? Now 32… Bxd5 is met by 33. Nf5! and 32… Qd7 by 33.Be4! Vishy conceived this entire combination in the dying seconds of the game only to miss the simple move 28..Qe1. Wonderful fantasy with a fatal flaw! In this game the world champion had better ideas and the challenger …better nerves! a) 13.Rb1 may be preferable to 13.Ra2. b) Carlsen should have followed his first instinct and dug in heels with 18…g6 19.f4 Ng7 20.Rb1 Rb6. If 21.Qb1 (Carlsen was concerned about this move) Qd7 should meet the requirements of the position. Garry Kasparov has the last word: Black queen and bishop on c8 never moved! Thanks to Ms Susan Polgar for giving us permission. These images were first captured by Ms Anastasia Karlovich, Press Officer, FIDE. Congrats to her for the lovely pictures.